At DBS, we pride ourselves on providing our customers with cutting-edge basement dehumidifier systems. Each of our warrantied systems is rated for energy efficiency and powerful enough to keep dry air circulating throughout the area. These dehumidifiers will ensure your basement is protected from excess moisture that can lead to mold growth and odors, ensuring you have a dry, clean space. Call us at 1-855-259-9625 or click below to request a free estimate on dehumidifier installation in your basement today! 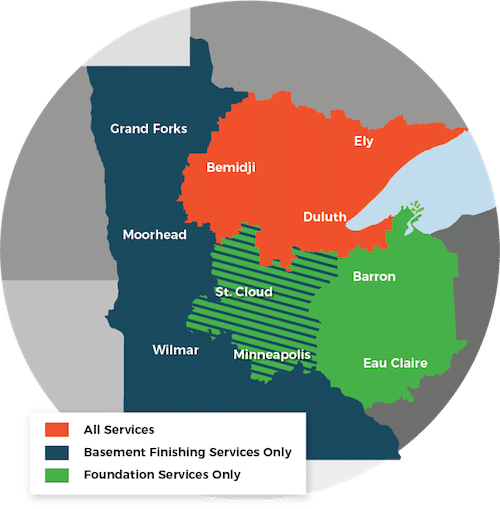 We provide basement waterproofing and moisture control services in Superior, Duluth, Minneapolis and surrounding areas in Minnesota and Wisconsin. To schedule a dehumidifier installation quote with one of our experienced waterproofing professionals, contact DBS by phone or e-mail today! We proudly serve Duluth, Superior, Minneapolis, Hermantown, Two Harbors, Cloquet, Esko, Virginia, Ashland, St. Paul and many surrounding areas in Minnesota and Wisconsin.